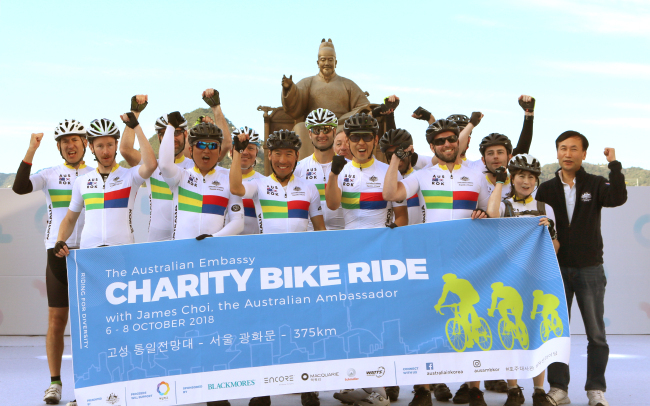 Members of the Australian Embassy, led by Ambassador James Choi, and the Australian community here took part in a challenging 375-kilometer cycling journey in Korea for three days to promote diversity and multiculturalism. The team of 15 Australian and Korean riders started their campaign at the Unification Observatory in Goseong-gun, Gangwon Province, on Oct. 6. They traveled southward along the east coast to the city of Gangneung on the first day, rode over the mountain range of Baekdudaegan the next day and finished at Gwanghwamun Square in Seoul on Oct. 8. The event is intended to promote the importance and benefits of diversity and multiculturalism, Australia’s unwavering support for peace on the Korean Peninsula and the virtue of a healthy lifestyle. Through corporate support from Blackmores, Encore, Schindler and Macquarie, over 8 million won ($7,060) had been collected prior to the event’s start. People are encouraged to donate money to the school via the Shinhan Bank account (100-028-968075) with Insooni and Good People (Hae Mill School) as the account holder. For inquiries, call Lee Kyung-jin at 010-9588-8761.